You know your ad may be too ambiguous in design if someone who isn't familiar with Transformers comes into your office when the ad is up and says... "What a strange-looking building." It was very wise to put Metroplex on a Transformers film poster. Have you seen the deluxe fig? Looks like a friggin' Rock Lord. Man, I think the layout and design guy/gal also needs to rethink the text positioning. 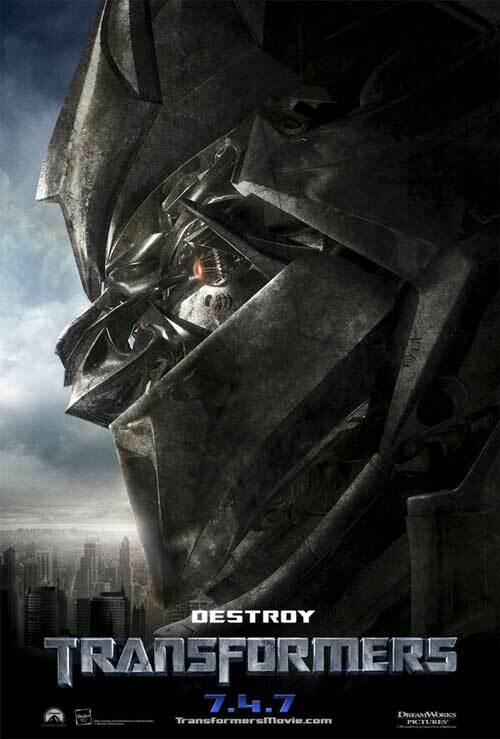 All I want to do right now is "destroy" the Transformers movie logo. I agree with Frowny, the deluxe version of movie Megatron looks like a POS ... although, it might be a Revoltech fig, since it seemed to have those types of joints. This page contains a single entry by Nala published on March 28, 2007 7:00 AM. Worst Transformer Ever! was the previous entry in this blog. A Who thing... is the next entry in this blog.